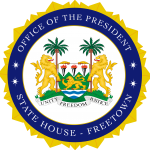 State Lodge, Freetown, Monday 18 February 2019 – The President and Chief Executive Officer of the International African-American Museum, IAAM, Michael Boulware Moore, has paid a courtesy call on His Excellency President Julius Maada Bio at his State Lodge Residence in Freetown and discussed possibilities of constructing a museum that will boost the tourism sector in the country. IAAM aims to re-centre South Carolina’s place in global history, illuminating its pivotal role in the development of the international slave trade and the Civil War. The museum connects visitors to their ancestors, demonstrating how enslaved Africans and free blacks shaped economic, political, and cultural development in the nation and beyond. In his statement, Mr Moore said that the IAAM had a unique opportunity in America to build an African-American museum on a site largely where the history began when the first set of trans-Atlantic slaves landed. He said that they had an international aspect to their mission and that they were looking at where the slaves came from and what were their culture and faith. The IAAM President also disclosed that he had visited Bunce Island where many slaves left and arrived in the country, noting that it was tremendously powerful whilst it also built the historical bridge among the continent, people and generation. He stated that they were focused on activating those connections by identifying appropriate ways to collaborate with the country and the site. “Like many African-Americans, my whole life I have yearned to learn from where I came from and now DNA science is providing us with that opportunity. So, for me to come here is not only under the auspices of building this museum but personally, to have identified my Sierra Leone and Mende connection and to be warmly embraced by the country is just overwhelming,” he said. Mayor of Freetown City Council, Yvonne Aki-Sawyer, said their perspective as a council was based on plans to transform the city through job creation of which tourism was an important sector. She said there was every need to partner with the City of Charleston because of the historic links and the tremendous opportunities it would bring to the country. On his part, President Bio said that history had separated a lot of Africans from their original places but noted that efforts were in place now to make amends by finding ways to come together, especially in a world that was highly inter-connected. He added that talks were underway on how to reconnect with brothers and sisters in the diaspora. The President said that the government was determined to create the enabling environment for those in the diaspora to come to the country and feel at home, saying that the modern world had helped people to discover their lost tracks. He also thanked the Mayor of Freetown for hosting the delegation while assuring of his fullest support to the project.